Find Your Niche! Volunteers are vital to Wachusett Greenways’ success. Come join us for opportunities for fun and service. From trail work, to events planning, to grant writing, newsletter production and other initiatives, Greenways provides a wide variety of rewarding volunteer opportunities, including the following and more. Ready to volunteer? Please contact Colleen Abrams at 508-829-3954, or send us a message to learn more. Bulletin Board Keeper. Nothing encourages trail visitors to explore like a neat, fresh bulletin board! Most of our trailheads have bulletin boards, and you can keep them up-to-date with maps, photos and news items. As a Bulletin Board Keeper, you’ll be helping trail visitors find their way and enjoy the extraordinary trails and greenways of Central Mass. Trail Clearing and Maintenance. Help clear and maintain the Mass Central Rail Trail (MCRT). Work with handsaws and loppers, clear brush, or clean drainage ditches. Lumberjacks also wanted. Contact us to receive notices for trail clearing. You can also contact trail team leader Gordo Elliott at 508-753-0420 to suggest a trail-clearing session. Welcome Center Stewards. Help care for our new Welcome Center at 21 Miles Road, Rutland. To offer your help, contact Christy Barnes at 508-755-6321, Jeff Keay at 508-886-6222, or send us a message. Springdale Mill Historic Site Committee. Cleared to preserve an example of the industrial heritage of the Wachusett watershed, the Springdale Mill Historic Site has become a popular destination along the MCRT. In addition to maintaining the site, the Mill Committee holds an annual celebration in September. You can help others to learn and have fun at this remarkable interpretive site. To get involved, contact Ruth Spaulding at 508-829-4869 or send us a message. Mass Central Rail Trail (MCRT) Task Force. Help design and manage the development of the MCRT. This popular task force welcomes the volunteer services of engineers, surveyors, bridge and road builders, trail inspectors, display and sign builders, and much more. We need both skilled professionals and those with a pair of willing hands. Contact Colleen Abrams at 508-829-3954 or send us a message. Hospitality. Put your energy and dedication to work as a Greenways ambassador. The hospitality team staffs information kiosks at rail trail events, local fairs and on other occasions. We also need Greeters at the new Greenways Welcome Center in Rutland. We can work around your schedule. Contact Abrams at 508-829-3954 or send us a message. Mailing Team. This hearty band conducts newsletter and membership mailing parties, along with good coffee and great company. Contact S. Jane Arntz at 508-829-7396, Colleen Abrams at 508-829-3954, or send us a message. Family Fun Day. 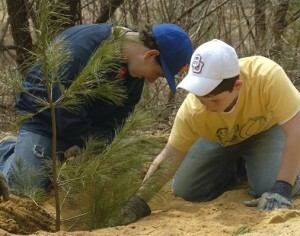 Help put on an annual spring party to celebrate the great outdoors! To sign on, contact Nancy Lucier at 508-835-3490, Colleen Abrams at 508-829-3954, or send us a message. Trailhead Plantings. This is an ongoing campaign to brighten the MCRT. Contact Christy Barnes at 508-755-6321 or send us a message. Trail Patrollers. Select your favorite trail section and help keep it in great shape by picking up branches and litter and keeping drainage clear. Contact Paul Hennessey at 508-886-6317 or send us a message. Grant Writing. Constructing and maintaining 30 miles of rail trail and other projects requires significant ongoing funding, much of it generated through government, foundation and corporate grants. Why not apply your writing skills to a good cause? To get involved, contact Colleen at 508-829-3954 or send us a message. The Greenways Connector, the Wachusett Greenways newsletter. Handy with a camera? Have a knack for interviewing interesting people or reporting on special events? Then The Connector could be your creative outlet. Contact manager Viv Ouellette at 508-829-5341 or send us a message. To offer your help with ConstantContact email communications, contact Ken McDonnell at 774-364-4965 or send us a message. Four-Seasons Exhibit. For several years, Greenways has held an arts exhibit at our annual meeting. Dozens of artists have shared their works. Would you like to be the exhibit coordinator or participate in the exhibit? Contact Christy Barnes at 508-755-6321 or send us a message. Greenways Guide. The new Wachusett Greenway Guide and Map documents the trails, landmarks and lands you can access on the MCRT. Next we’ll be developing other trail guides. To help, contact Colleen at 508-479-2123 or send us a message. Website Content Guru. Contact Ken McDonnell at 774-364-4965 or send us a message. Event Leaders. Lead a walk or bike ride to your favorite spot on the trail. Share your love of wildflowers, birds, trees or history. Canoeing, cross-country skiing, snowshoeing and bicycling leaders are also prized. Contact Christy Barnes at 508-755-6321 or send us a message.